If there is such a thing as the fabulist prose poem, then Richard Garcia is the master of it. Still, we diminish the unpredictability of his imagination by comparing him to the usual fabulists-Cortazar, Borges, or Kafka. By now Garcia has mapped out his own strange territory. 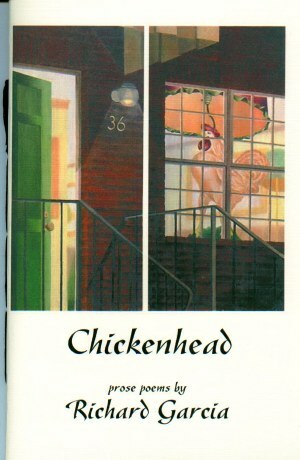 It's a land where reality is pliable and facts of the imagination reign supreme, where Sappho morphs into Dale Evans, a dog becomes a psychiatrist and analyzes its master, and a gangster named Chickenhead resembles Christ. These sketches are both comic and terrifying, dreamlike yet clearly metaphors for our so-called real world. In Chickenhead, Garcia has fun with us, which means, of course, that he is deadly serious. Peter Johnson is a widely published and anthologized prose poet. Among his books are Pretty Happy and Eduardo and "I". He is the editor of the anthology, Best of the Prose Poem: an International Journal. A book is a finer pillow than a stone. A drowned book floats face-down. A book in a sandstorm constantly changes its mind. Who has not heard of the book carried over the heart that stopped a bullet? A watch was in love with a thief, but the thief had many watches. He wore several on each arm. Like most watches, eventually it got sick of dreaming. Nobody cares that the book eats so little to stay alive. Nobody cares about the book of bandages. There is a book looming on the horizon. The book open to the sky is the horizon. What to say about the water bottle? It hardly exists, having already failed as a river. And the rain, tapping its fingers, so impatient, hasn't it already failed as a cloud? Richard Garcia is the author of The Flying Garcias, University of Pittsburgh Press, and Rancho Notorious and The Persistence of Objects, both from BOA Editions. His poems have appeared in The Georgia Review, Crazyhorse, Ploughshares, Pushcart Prize XXI and Best American Poetry. He teaches in the MFA in Creative Writing Program of Antioch University Los Angeles. He lives on James Island, SC, with his wife, poet Katherine Williams, and their dog Louie.